Tennyson is the musical identity of Luke Pretty from Edmonton, Alberta. Since starting his journey from busking on the streets of Edmonton at the ages 9, Tennyson has slowly matured into one of the most innovative artists in the music industry with his blend of jazz music and electronica gaining the attention of some of the biggest independent producers such as Ryan Hemsworth, Lido and Skrillex. In two short years, Tennyson have gone from unknown Canadian electronic artist to working relationships with multi-platinum, Grammy winning artist and international superstar Skrillex. Tennyson released Like What , a six-song EP in partnership with WeTransfer in late 2015. The EP went on to garner millions of plays and prompted invites from prestigious festivals such as Lollapalooza (Chicago), Way Home (Toronto), Austin City Limits (Austin) and Osheaga (Montreal) to name a few. Luke didn’t stop there, touring with international powerhouse M83 throughout the fall of 2016 playing to crowds as big as 6,500 a night. In early 2017, Tennyson partnered with Redbull to release “Tuesday, Wednesday, Thursday” a collaborative EP with LA-based musician Mr. Carmack. The EP went on the spawn features from: Beats 1’s Zane Lowe, Complex, Esquire, Vogue, NPR, Stereogum, Pitchfork, FACT Mag and a variety of other outlets. His quickly rising star throughout the music world has not gone unnoticed, having partnered with Paradigm Agency (North America/Australia), Little Big Agency (Europe) and Alchemist Asia (Asia) all within the last year and touring all markets. In 2017, Luke accompanied by sister Tess, completed two sold-out European runs (10+ dates), their first ever Asia headlining tour and festival and club dates throughout Australia. Late 2017 saw the release of Uh Oh, the most complete project to date featuring a song with the BRIT & Grammy nominated, multi-platinum singer Aloe Blacc. The project has garnered millions of streams and propelled Tennyson into the spotlight leading into 2018. ‘Komorebi’ (Japanese for sunlight that filters through tree leaves) is a unique Electronic- Alternative Act from New Delhi, India and the musical baby of Tarana Marwah, Indian composer, singer producer and instrumentalist. Inspired by scores from anime and chip tune music she heard as a kid, the music is whimsical, orchestral and celestial. Tarana released her first self-titled EP in 2015, after which the act gained mercurial success. Some notable performances at festivals include NH7 Weekender, Magnetic Fields, Red Bull Tour Bus, Echoes of Earth, Wonderflip and Music Matters in Sri Lanka. 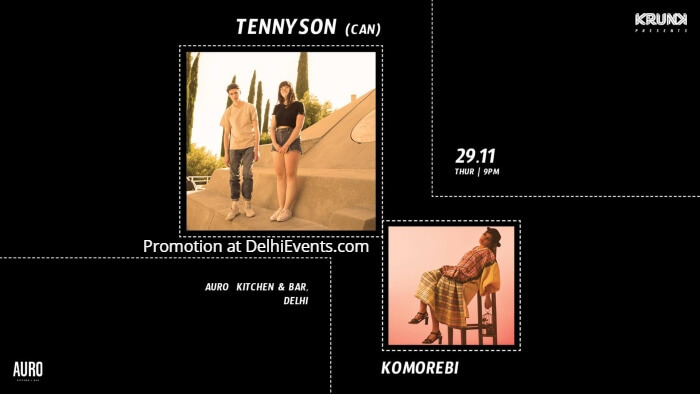 Komorebi’s debut album ‘Soliloquy’ that was released in 2017, has also caught the attention of many – placing Komorebi on the Indie radar from India. The 8 track Album features vocals on all songs, with honest lyric writing, as well as Mohini Dey, Warren Mendonsa, and Sohrab Nicholson as collaborators. There have been interesting combinations with various Artists, Visual Jockeys and Animators for the act in 2017. The release of an animated Music Video for the song ‘Time’, reveals an aesthetic and special identity slowly being created for the Artist. Her next body of work features more experimentation with art, language, and various unique instruments. She has been branded one of the most creative younger indie artists in India.